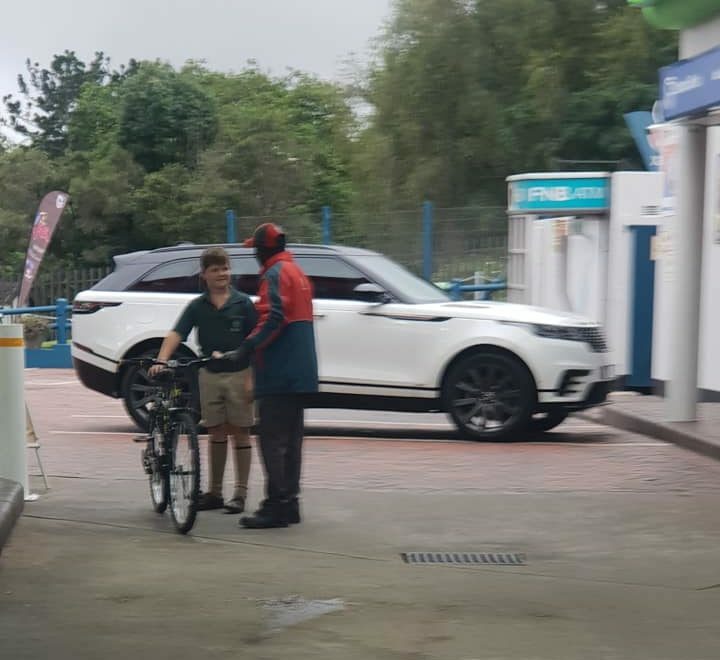 10-Yr-Old Uses Hard-Earned Vacation Money To Buy Friend At Gas Station Sweet Gift. One of the best parts about being a parent is reaching that wonderfully rewarding moment when you realize you’ve raised a good human being. For one mom in South Africa, that moment came last week, but the story starts a couple months back. 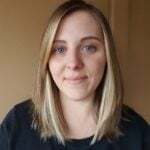 Mandy had stopped at a Caltex gas station in Gillitts with her 10-year-old son, Vaughn, who wasn’t feeling very well. There they met a friendly attendant named Tony, who had the sick little boy smiling and laughing within minutes. Mandy and her son have made regular trips to the station ever since so Vaughn can visit with Tony. During one such interaction, the pair got to talking about how much they loved riding bikes. 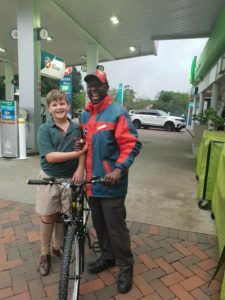 As Mandy explains, “Tony always takes the time to talk to Vaughn about the various bikes we haul to Giba,” so when Tony asked for them to look out for a decently priced bike he could buy, they agreed. But Vaughn had something much better planned for his new friend. Above all things I regard kindness of heart, and over the years I’ve tried to live like that and teach my child to do the same. Vaughn has been collecting all the silver money around the house for months, saving for a ‘holiday’ for us. 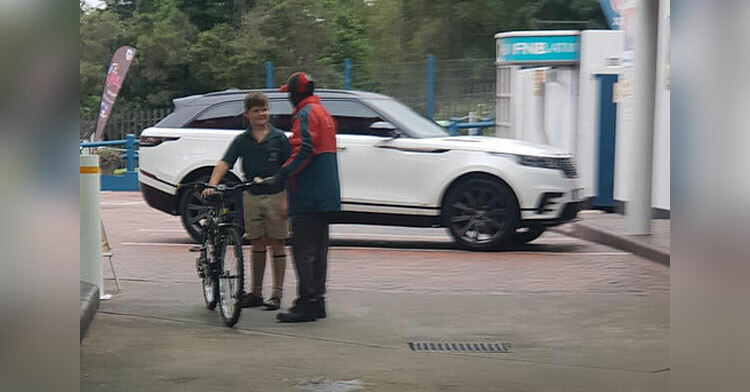 One night he came to me and asked if I really wanted a holiday and upon asking why he said he would rather put his savings towards helping Tony get his bike. News of Vaughn’s good deed spread like wildfire online. 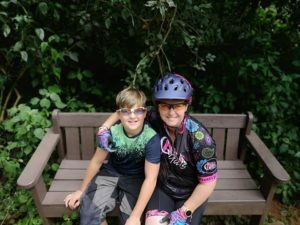 Mandy’s post was shared thousands of times, garnering hundreds of comments praising her son. Even the retailer they’d bought the bike from noticed and had gifts of their own to give: store vouchers for Tony and Vaughn! 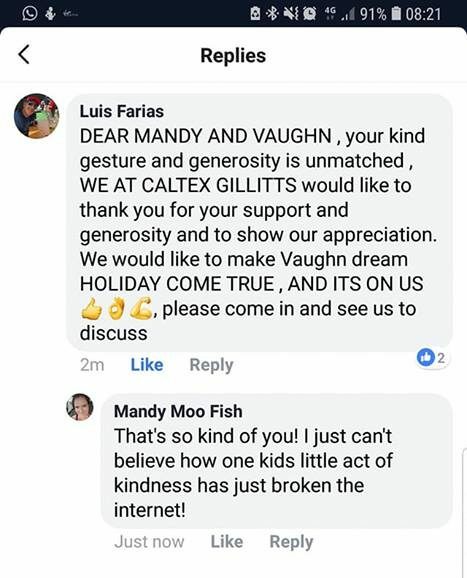 But the giving train didn’t stop there — Tony’s employer, Caltex, offered to pay for that vacation Vaughn and his mom gave up! This heartwarming story just goes to show that generosity only grows the more you show it. 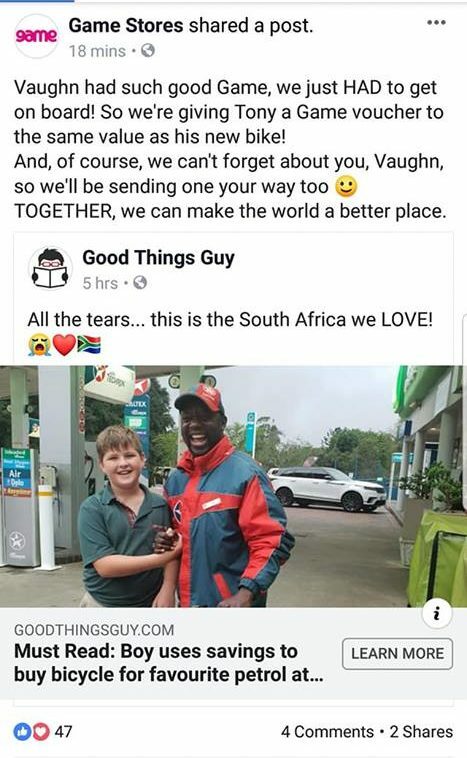 Share Vaughn’s kindness with the world to inspire others to pay it forward.